Scarlet is used to keeping people close and helping them with their problems. Whether it's the depressed teenage girl across the street or her gullible next door neighbors involved with an internet scam, she is the one always helping them out. But when her older sister Juliet comes home pregnant with her new husband Hayden, the problems Scarlet encounters--like her uncertainty at Juliet being a good mother, her frustrations with her mother, and her attraction to Hayden--might be a little too much to handle. Now for the first time, Scarlet will have to take a step back and learn to solve her own problems, and let those she loves do the same. 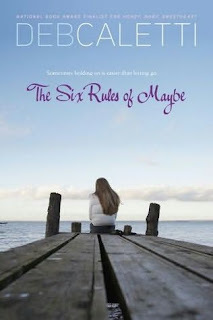 The Six Rules of Maybe is a beautiful and insightful novel. Scarlet's story and her struggle to deal with all of the issues that are unfolding around her not only mold her into a stronger and better person, but also open her eyes to her own nature, and her mother's and sister's, and the underlying cause for the way she and her mother cling to those they love, and Juliet pushes so many people away. Scarlet's attraction to Hayden also adds a very interesting and complicated twist to the story, and though it is warranted and understood, it is like watching a car wreck unfold--you know there will be a collision, and things could get quite messy, but you need to see it through in order to see just how many pieces there will be left to pick up at the end. It is through these revelations and events that each of the Ellis women ultimately learn that life is complicated and messy, and not everything can be fixed immediately (or ignored)--sometimes you have to let go and let others stand on their own, and sometimes you need to reach out for help. With a smart, sensitive, and modern voice, Caletti has created in The Six Rules of Maybe a strong and lovely book about forgiveness, trust, responsibility, and growing up. Cover Comments: I like the way the cover has a wide open view of the sky and the horizon. I think it fits the ambiguity of the title well. I haven't read any of Deb Caletti's novels but I've heard that she is a good author. I loved your review and I will definitely be picking this one up. and i've never read Deb caletti. not sure why. she sounds exactly like the kind of author I love. I am SO glad I'm not the only one who loved this book! I've seen so many others not enjoy it and I just fell in love with the writing and the characters. Pure heart was put into each sentence.